When the baseball gods speak, you listen. They ARE the higher authority. Even higher than Mike Labanowski. Labs, because everyone in baseball must have a nickname, is my friend because of baseball. We first met in 2014 as teammates at Yankees fantasy week and the off-the-field relationship grew. He’s Polish. I don’t pretend to be. He also claims he’s 3/64th Jewish which he thinks gives him a license for front of the line buffet passes; unlimited discount coupons and prime Rosh Hashana seating. He’s also the guy sitting next to you on a five hour flight you only need to ask one question to kill four time zones. More than anything though, Labs loves baseball. He’s fifty-seven, lives just outside of Tampa and plays year-round still at a very high caliber. Nobody knows what he does for income or if he even works. He’s always playing ball. You can find him at Pirate and Yankees camps or playing tournaments around the country. He’s also a partner in a baseball management company that organizes twice a year adult events in West Palm Beach. His rocket shortstop’s arm goes to Cuba every spring with a select all-star team to play around the island and another of his teams plays the inmates annually at San Quentin, where you don’t argue calls and you use the visitor’s dugout. Labs is baseball. We were teammates for the third straight year last January at Pirates camp in Bradenton, Fla. It was there the baseball gods first spoke to me. They gave me a chance, five months after my cinco de bypass, to play the game one more time. They knew it was time for me to quit and so did I. When you can’t straighten back up after bending for a ground ball and when trying to get under a pop-up you stagger like Otis looking for his Mayberry cell, it’s time to call it a day. At that camp we made it to the Pirates championship game and lost. It was the fifth championship game I’ve lost since 2010, never winning one. Somewhere Marv Levy and Scott Norwood smiled. I knew my final at-bat that week would actually be my final at-bat ever. I was done. 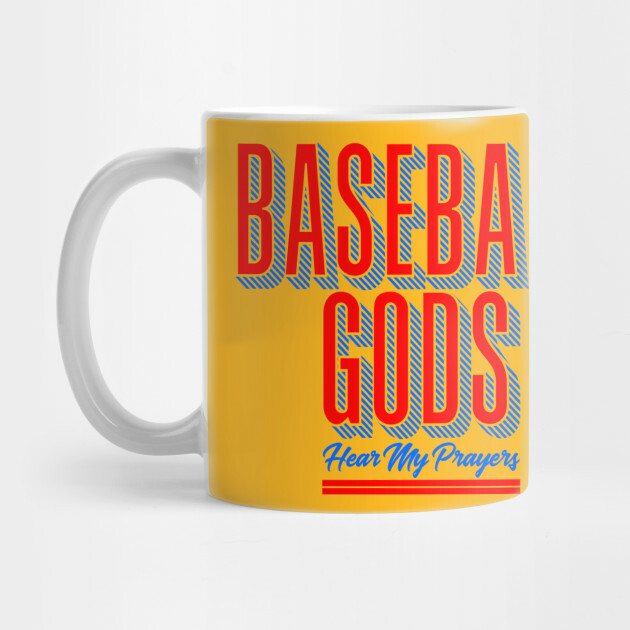 Fittingly, I grounded into a double play, 4-6-3 if you’re scoring at home, which you weren’t, but the gods were. That was it. I was finished. For a guy who hadn’t swung or thrown a baseball for forty years, until age fifty-seven in 2010, these camps were the perfect tonic for my latter years — I got to put on a uniform and romp in the grass twelve times in eight years; seven as a Pirate, four as a Yankee and for some reason once as a Detroit Tiger. I met diamond heroes of my past who became friends; I met guys from around the country who allowed me to share this special week of adult little league with them and in the process I got to seriously deplete my bank account. I also wrote two books about my experiences. And best of all I was just being compliant as it was originally Andi’s idea that I do this. Then Labs called last spring. My mistake was answering it. 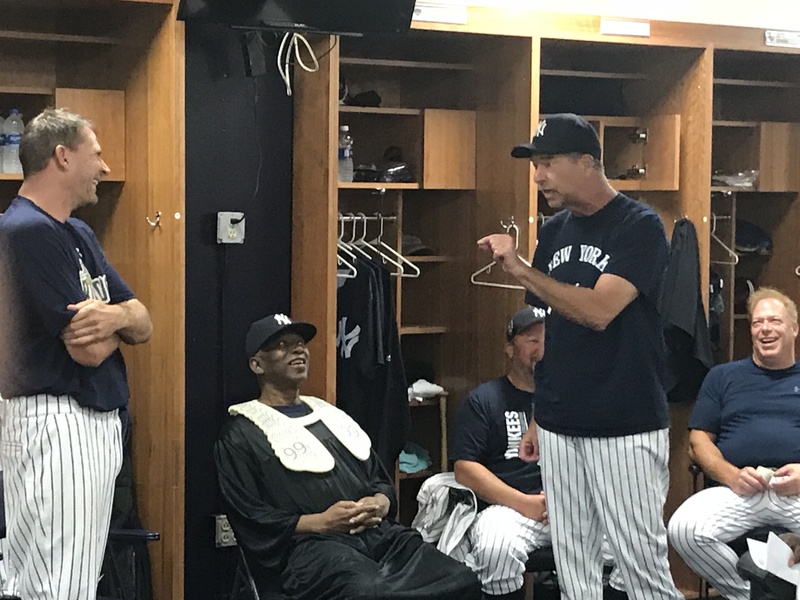 He knew my frustration at letting all those championships get away and he told me we would get one if, for one last time, I came to Yankees camp with him the first week of November. They were putting together their team and the core would be the same group that went 8-0 the year before. Half of the twelve man roster were returnees including the foremost Yankees fan in the U.K., red-shoed Roger McQueen who was coming back over from London for the third time to defend. 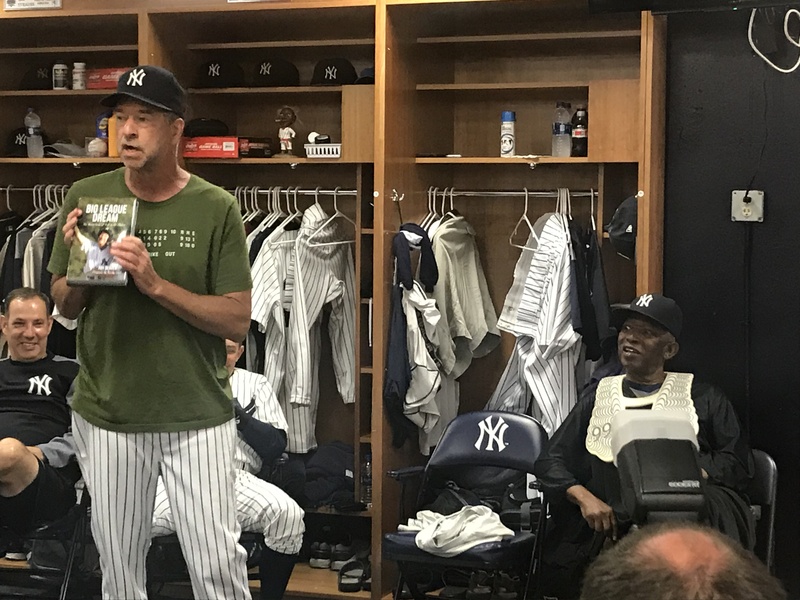 McQueen is a fun, mid-fifties bloke who over the last twenty years self-taught himself baseball and knows more Yankees history than most talk radio junkies in Jersey. The team would be managed again by former Yankees, Padres, Giants and Pirates pitcher Brian Boehringer, reserved but sarcastic, who now has 2017 fantasy camp championship hardware to compliment his 1996 Yankees World Series ring. I didn’t ask the gods for permission because I knew they would say otherwise. Even though I knew better I told Labs I would give it one last shot. For the first time in thirteen camps I did no pre-camp prep. No hitting, no throwing and most importantly no running because that ain’t pretty anymore to begin with. Of the seventy guys in Tampa last week with an young average age in the early to mid-50’s, I was the fifth or sixth oldest. 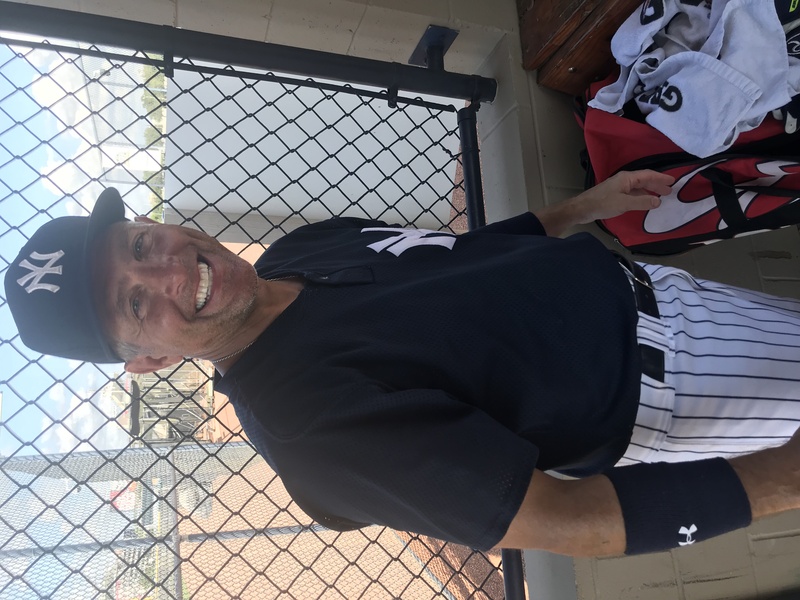 I just showed last Tuesday morning at Steinbrenner Field with a glove, a uniform and a saddle to ride Labs and the fellas to my first title. I figured my time in the field during the week would be limited which I hoped would give me some cred with the gods. I’m sixty-six, I can’t play nine-inning doubleheaders four days in a row and we had the best first baseman in camp, James Provenzano, who when he isn’t between the white lines is the ‘car dealer for the people’ in upstate New York. I figured I’d play three, maybe four innings a game at first behind Provenzano and take a regular turn as a DH. A day or two before camp started my plan hit a speed bump. Two of the returning vets on our team canceled because of sickness in their families. Now with only ten on the roster, my idea of sitting as much as possible was in deep danger. Defending myself in kangaroo court. Brian Boehringer (l) is the prosecutor; the legendary Mickey Rivers is the justice. Talking baseball with Al Downing never gets old. 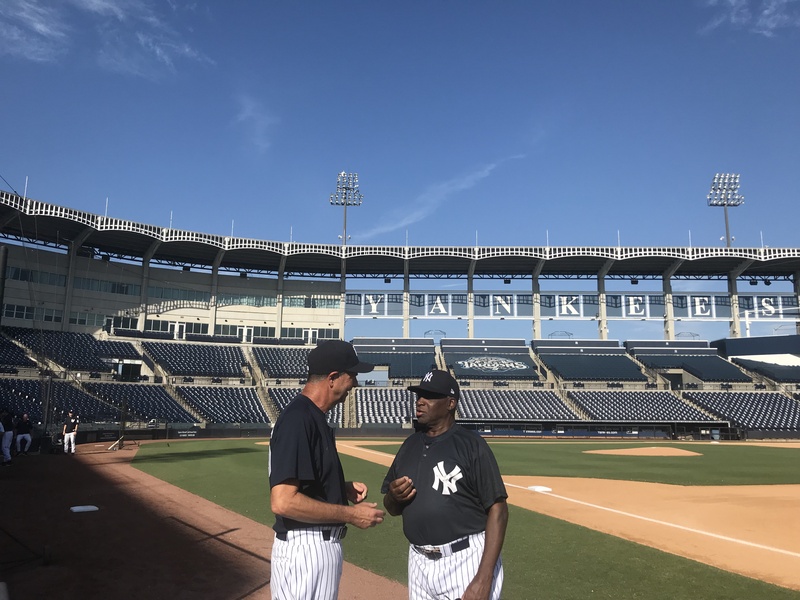 I was pleased, however, to learn that Al Downing, the standout 1960s southpaw pitcher of the Yankees and Dodgers, would join Boehringer on our coaching staff. Mr. Downing, now seventy-seven, is a gentlemen as well as being an encyclopedia of the game. I spent as much time with him as I could and reveled in the memories and stories he told. His baseball mind is still as sharp as his inside fastball used to be as he recalled even the smallest of details going back to his 1961 call up with the Mantle-Maris Yankees to Hank Aaron’s 715th home run at his expense. In spite of it all, things looked as if they would turn out the way Labs promised and I could mothball my uniform around my first championship. A four for four day off my bat at the plate Thursday afternoon on Steinbrenner Field in front of nine spectators gave us our fifth straight win and all of a sudden I was cocky and feeling pretty good about myself and was only one sprained finger away from flippin’ off the gods. Most importantly we moved into the must-win semifinal game, which we won in a 18-3 rout to advance to the title tilt. And then the baseball gods got busy. They got even with me but I figured I would laugh last anyway. They made sure their message registered with me, that I was tempting fate, during the semifinal and final games. They held me to an embarrassing 1-11 at the plate in the two games but I didn’t care. I would be done after the championship game anyway, and all was going swimmingly for the team. We took a 12-8 lead to the bottom of the ninth, three outs away from that first title in six tries, just as Labs predicted. And Labs did his share to make it happen with a bat all week as hot as a Jim Acosta-Trump throw-down. And then the gods rumbled. The Scott Bradley-Chris Chambliss coached opponents went boom, boom, boom, boom, boom and one final boom. Six batters up, not one retired, and five runs later a walk-off 13-12 kick right in the groin. The gods were now laughing. “We told you so” I could hear as I quickly packed my stuff and drove straight to the same Total Wine on Dale Mabry Highway I was at the night before to return the four bottles of champagne I bought for the celebration I was so sure was forthcoming. Right before the bubbly turned to vinegar in the unseasonable Florida heat, I got my $25.87 refund. Not per bottle. For all four. I only buy the best to pour over someone’s head. The baseball gods are always right. I knew this day would come, but I was hoping the jai-alai Gods would take me first. It’s been a great run for you, Roy, but an even greater run for us, your fans. You’ve made us laugh, made us cry and made us wish WE had the chutzpah (not to mention the money) to do what you’ve done. Congrats on a truly great Fantasy Camp career. Nice story Roy. I, like you, was not able to win the big one at the Pittsburgh Pirate Fantasy camp. My last camp, in 2010 was your first camp and we were on the same team. We lost the championship 3-0. I knew that camp would be last. I was battling neck and back injuries, having 3 surgeries up to that point. In November of 2010 I had my 4th surgery, all disectomys. My final camp i couldn’t throw, hit, field or run, but I had a great time anyway. The icing to this cake was becoming a Pittsburgh Pirate Fantasy Camp Hall of Famer. I would like to say you become a HOF for outstanding play, but really its for longevity. You come to camp 10 years or more, and youre a Hall Of Famer. I do understand how the baseball gods treat you! In the summer of 2017, I had a laminectomy done. S 1- S 5. There will be no more playing baseball for me. The baseball Gods made it clear to me with an exclamation point. Roy, you got to play a few more games, even after your heart surgery. I hope you can cherish that time on the field with your teammates. Isn’t that what it’s all about anyway? Father time wins in the end! Now you can write book #3!! Your satirical descriptions of your play is why you are a champion. Mazel Tov, and not once did you “PITCH” your web site! How do you expect to sell any books.